When I tell people I'm a "gluten-free vegan" I mostly get audible "ughs" and noticeable winces in reply, followed by the question, "What do you eat?" No doubt, this diet is high-maintenance -- but I feel lucky that the marketplace is quickly evolving to accommodate people like me with specialized needs when it comes to food. When I heard about Purely Elizabeth, of course I was ecstatic. 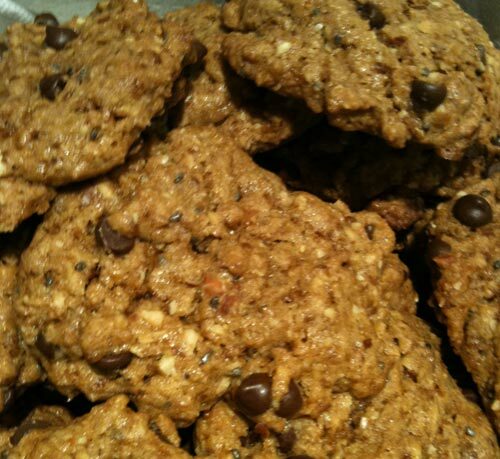 Baking mixes that are both gluten free and vegan? Brilliant! They are also all-natural and organic! And before you ask "why not bake from scratch?" It's because I am short on time with two small children, and the amount of ingredients required to make GF baked goods is often gargantuan and pricey! Olivia and I whipped up a batch of Purely Elizabeth chocolate chip cookies in no time, as Ashton took a cat nap. Organic Millet Flour, Organic Coconut Palm Sugar, Chocolate Chips (Evaporated Cane Juice, Chocolate Liquor, Non-Dairy Cocoa Butter), Organic Almond Flour, Garbanzo Fava Bean Flour, Organic Chia Seeds, Baking Soda, Sea Salt. See our baked cookies above. I devoured them, and Olivia loved them too! 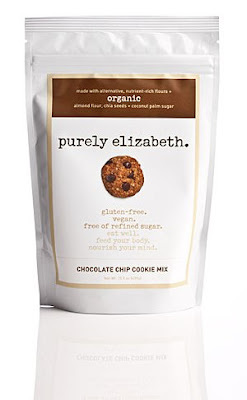 I really love that Purely Elizabeth products are made with nutrient rich flours, superfood seeds, organic ingredients, and that they are free of refined sugar, preservatives and GMO's. The line includes a delectable array of gourmet cookie, muffin and pancake mixes that will all satiate your sweet tooth in a healthy manner!